The 2008 American Silver Eagle Coins saw intense demand for the bullion strikes, but faltering mintages for the proof and uncirculated Eagles. In fact, demand was so strong for the bullion Eagles that the Mint had to suspend sales completely a couple of times to its network of authorized purchasers. It also instituted a new rationing program for the coins which would reach into the years to follow. The numismatic versions of the Eagles would have probably seen better mintages had demand for the bullion coins not been so high. As the Mint is required to strike the bullion Eagles to meet public demand, it was forced to place the proof Eagles on a sell-out status in August, leaving many unable to obtain the proofs for their collection. The 2008 Bullion Eagle mintage shot to a record level and came in at 20,583,000. This far surpassed the previous record held by the year 1987 (which was the first full year in which the Eagles were available). It also dwarfed the 2007 numbers by 11,554,964 coins. The 2008-dated Proof Eagle Mintage dropped to 700,979. This was a decline of 120,780 from the previous year, but can be partially explained by the fact that the Mint placed them on an un-expected sell-out in August. Uncirculated Silver Eagles also declined for the year and came in at 533,757, a drop of 87,576 from the previous year. The 2008 Eagles were the twenty-third versions of the coins to be available from the US Mint since their debut in 1986. 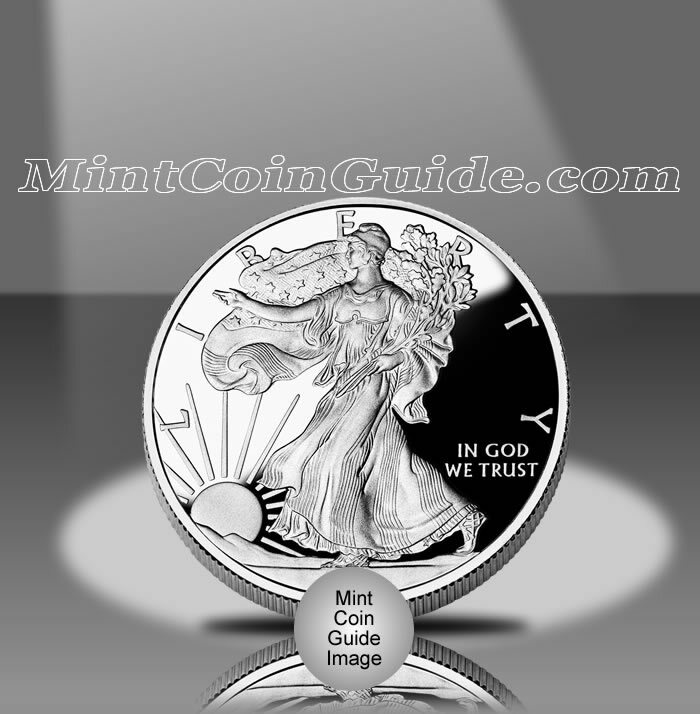 Proof Silver Eagles were released by the Mint on January 3, 2008. The Uncirculated Eagles became available on March 17, 2008. Bullion Eagles were available for most of the year with some suspensions and rationing occurring. The Mint raised the price of the Proof Eagles to $31.95, an increase of $2 from the previous year. Uncirculated Eagles jumped to $25.95. Bullion Eagles (as always) were sold by the Mint’s network of authorized purchasers for a small premium above the current spot price of the silver they contained. A ‘W’ mintmark on the uncirculated and proof Eagles indicate they were struck at the US Mint’s facility in West Point. The bullion Eagles were also struck there, but contain no mintmark. Adolph A. Weinman "Walking Liberty" is featured on the obverse (heads side) of the Silver Eagle. It was originally featured on the 1916-1947 half dollar. A heraldic eagle designed by John Mercanti is found on the reverse (tails side) of the Silver Eagle.